A day that will be forever known in the city of Cleveland, the United States Pro Kart Series closed out the second event of the 2016 season in Shawano, Wisconsin at the US Air Motorsports Raceway. Serving as the fourth round of the championship program, the weekend completed under sunny skies perfect for racing. Session after session, drivers made sure they pushed to the limit, earning as many points as they could toward the title with a number of drivers adding to their win total on the season. Brandon Lemke put himself as the leader in the championship chase of the Franklin Motorsports IAME Pro division following a sweep on Sunday. 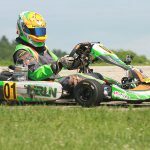 As he did last year sweeping both Junior categories on the weekend, the Franklin Motorsports / Merlin driver dominated the day toward earning his second victory of the season. Saturday’s attempt came up short, with he, his father and Jason Birdsell ensured it would not repeat. Lemke led the category from qualifying to the final checkered flag with a wire-to-wire victory in the feature. The lead challenger was Saturday winner Zach Holden until the Comet Kart Sales / Tony Kart driver had his throttle stick on lap five after it ripped off and wedged itself wide open. That handed off the second spot to Ryay Norberg as the Tony Kart driver ran the fast lap of the race, but finished over two seconds back. Joining them on the podium was Robby Seward with his best performance as a Senior driver. Piloting an old ART GP chassis – which now falls under the Birel ART name – secured the third position with solid pace. Andrick Zeen (Praga) drove to fourth with Round One winner Braden Eves (Kosmic) in fifth. AJ Myers (iKart) bounced back from his DQ yesterday to finish sixth with TJ Koyen (Exprit) having the pace for seventh. Calvin Ming (FA Kart) ended up eighth with Brandon Jarsocrak (Praga) and defending champ Elliot Finlayson (Tony Kart) making up the top-10. The Comet Racing Engines Yamaha Pro final was another four driver battle. Saturday winner Dakota Pesek (Top Kart), Zach Holden (Tony Kart), Brandon Lemke (Merlin) and Alexander Kardashian (Top Kart) were in the hunt throughout the race. It was anyone’s race to win, and came down to the final lap. Top qualifier Lemke held the lead until going down the wood’s straight, holding a defensive line and Pesek drove around him on the outside of turn five. Pesek fought off the final pressure from Kardashian to secure his third victory of the season. Lemke fell to fourth with Holden slipping through for third as Adam Crepin (Tony Kart) placed fifth. The win total is now up to three for Alex Bertagnoli in the Innovative Performance IAME Junior division. 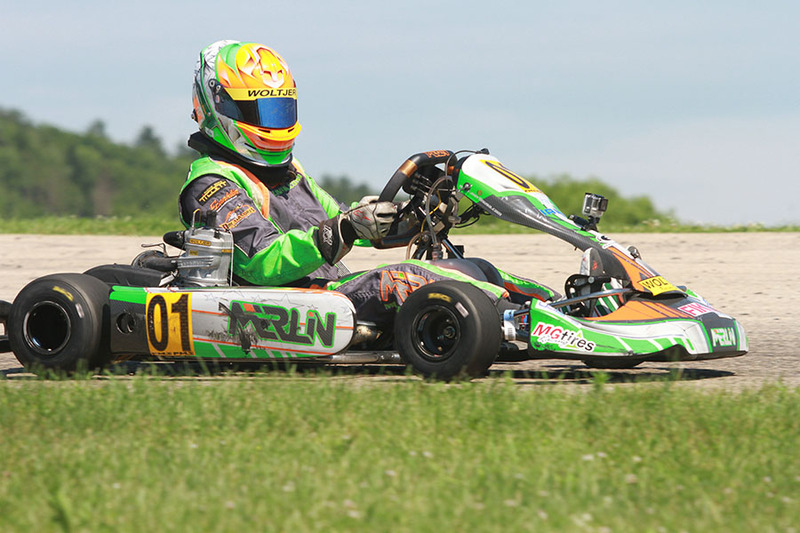 After qualifying first and winning the second heat race, Bertagnoli (Merlin) drove away to a wire-to-wire victory Sunday. Myles Rowe (Tony Kart) advanced from P7 to second in the Final, dropping Lance Fenderson (Tony Kart) in the final lap. Austin Schaff (Merlin) and Sam Mayer (Merlin) completed the top-five. A wreck at the opening corner of the Woltjer Racing Engines Yamaha Junior main event shuffled up the field, taking top qualifier Zack Pretorius (FA Kart) and others out of the race early. Sam Mayer (Merlin) led the field to the green flag and was among the five drivers in the lead pack. Fellow Franklin Motorsports / Merlin drivers Austin Schaff and Allex Bertagnoli were joined by Colin Neal (Tony Kart) and Matthew Northrop (Tony Kart) in the lead pack. Their fight ended up going down to the wire with Northrop the driver on the move. Mayer led on the final circuit with Schaff trying to find a way past for the lead. Coming to the checkered flag, the two made contact trying for the same piece of real estate, allowing Northrop to slip under. Showing up Saturday night and racing just Sunday, the Innovative Performance driver crossed the line for his first USPKS victory. Schaff came across second but was penalized for the contact, advancing Bertagnoli to second and Neal third. Mayer dropped to fourth and Schaff classified fifth. 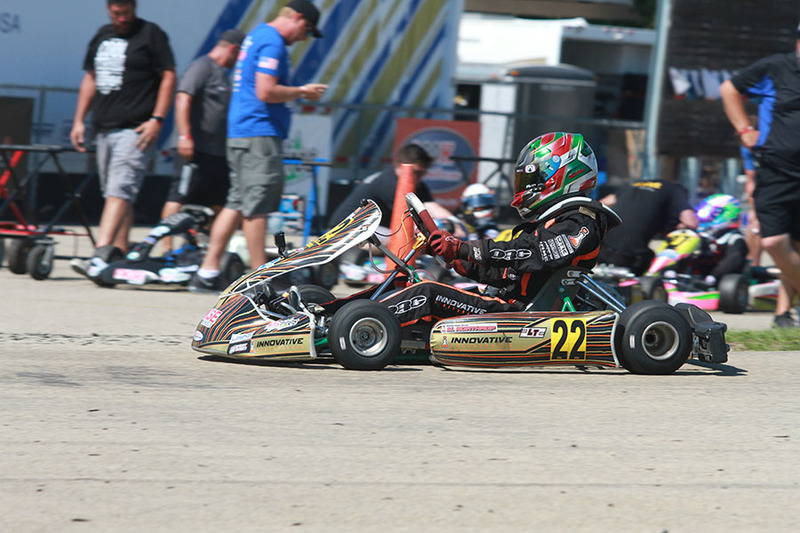 Reece Gold seemed untouchable throughout the day in the Allison Racing Engines IAME Cadet class. The Benik driver swept the day for his third victory of the season. After topping the charts in qualifying and winning both heat races convincingly, Gold lost the jump at the green flag to fellow Benik driver Tyler Maxson – the outside polesitter. It only took three laps before Gold returned to the point, and drove away to his third victory of the season. Maxson held the runner-up position for the fourth straight main event. Elio Giovane (Benik) won the battle for third over Zane Maloney (Benik) with Devin Gomez giving Benik a complete sweep of the top-five. Kaden Wharff (Top Kart) made it four for four on the season in the Switch Racing Engines Yamaha Cadet division. The Saturday winner was under pressure from Garrett Adams (FA Kart) early, eventually pulling away to a near three-second advantage to remain perfect in the category. 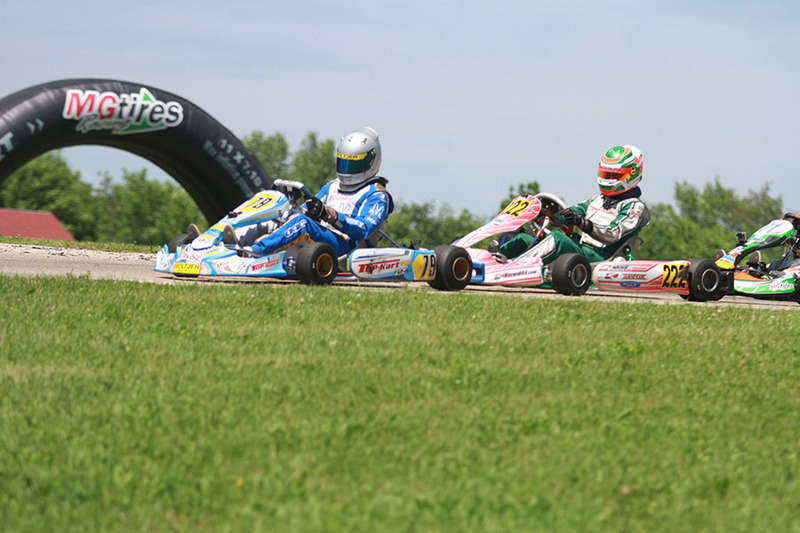 Toward the end, Adams was run down by a group of drivers, with Zane Maloney (Tony Kart) working around for the runner-up position. Tyler Maxson (Benik) advanced from eighth to fourth with James Lynch (Haase) placing fifth in his best finish of the season. A spin in Heat #2 was the only mistake made by Brent Crews all weekend long in the Motorsports Driver Development IAME Rookie category. A 720 degree spin on the exit of turn four resulted in Crews losing the second heat race after a perfect score to that point. The North Carolina driver bounced back to earn his fourth victory of the season, driving to five-second advantage in the main event. Paige Crawford (Tony Kart) drove to the runner-up spot over Eli Trull (Arrow) with Elliot Cox (Benik) and Danny Dyszelski (FA Kart) completing the top-five. Elliot Cox evened up the score in the win column with his second on the weekend in the QPS Employment Group Yamaha Rookie division. 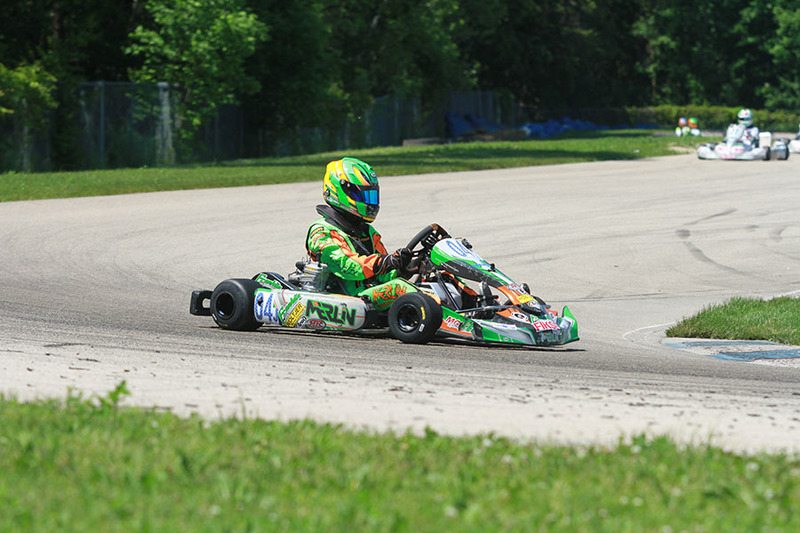 The Benik driver recorded a sweep on the day after a hard fought battle in the main event. At the line, Cox took his second victory by two tenths ahead of Paige Crawford (Tony Kart) and Danny Dyszelski (FA Kart). Eli Trull (Top Kart) ended up fourth with Rylie Myers (Praga) in fifth.